When looking for Finger Lakes accommodations, Cayuga County has some of the most beautiful getaways in the region. Search below to discover some of the finest Finger Lakes B&B’s, Hotels, Motels and more. The City of Auburn in the heart of Cayuga County and the Finger Lakes is a hub for hotels with the full-service Holiday Inn and the Hilton Garden Inn and the limited-service Inn at the Finger Lakes being the largest hotel properties. A variety of privately owned hotels and motels can also be found in Auburn, NY. In addition to hotels, Auburn also offers luxurious B&Bs and inns such as 10 Fitch, voted the 2009 &apos;Travelers Choice for Romance&apos; by iloveinns.com and the historic Springside Inn, serving visitors since 1919! 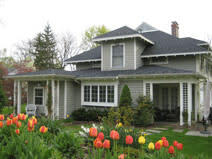 Whether you are looking for full service hotels, quaint bed & breakfasts, historic inns or campgrounds, Cayuga County&apos;s communities including Auburn, Fair Haven, Skaneateles, and Aurora have something to suit your taste and lifestyle. If your ideal vacation includes sleeping under a cozy down comforter or waking up under the stars, you can find it here. Cayuga County&apos;s central location in the Finger Lakes Region and proximity to Syracuse, Rochester and Ithaca make us a popular meeting location. Our conference facilities can accommodate groups up to 600 people for meetings, banquets and trade shows. Many Finger Lakes hotels, inns and bed & breakfasts offer special getaway packages. Group tour packages are also available. For other lodging options including cabins, cottages, and private rooms visit airbnb.com.